Who wouldn’t like something sweet, crunchy, & nutty?! 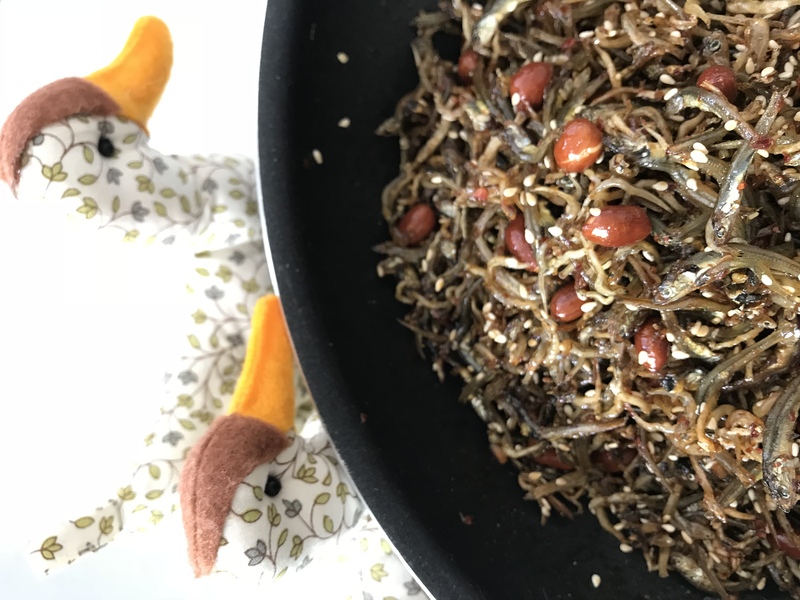 Today’s recipe, myeolchi-ttangkong-bokkeum is exactly that: stir-fried dried anchovies and peanuts. It tastes like a sweet, salty, crunchy snack. This is one of the most common and popular side dishes for Korean lunch boxes (dosirak), and almost every family has its own recipe for it. Sometimes chopped green chili peppers are added, to make it spicy or Korean gochujang (hot pepper paste) is added. If you want to add hot pepper paste, just add 1 tablespoon hot pepper paste to the seasoning sauce. In the old days, myeolchi-bokkeum tended to be saltier because we added more soy sauce or hot pepper paste, but I use less salt for this version. It still tastes a little salty because the dried anchovies by themselves are a little salty. This is a kind of mitbanchan, or preserved side dish, that you can keep in the fridge for up to one month. 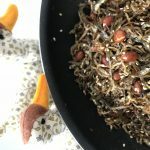 Like I do in the video, you can make it ahead of time and then take it out and combine it with different side dishes and rice to quickly make a well-balanced, delicious meal. 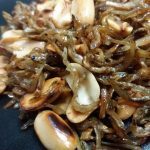 You can serve it as a side dish with rice and also it will be a good side dish for beer! Put the dried anchovies in a colander. Shake and toss them so that the smallest bits and broken pieces fall through. Combine the soy sauce. water, sugar, and rice syrup in a small bowl. Mix well. Heat a skillet over medium high heat and add vegetable oil. Add the garlic and stir with a wooden spoon for 10 seconds. Add the anchovies and peanuts. Turn the heat down to medium and stir for a few minutes, until the peanuts and anchovies turn light brown and crunchy. Push the anchovies and peanuts to the edge of the skillet. Remove from the heat and add the seasoning mixture to the cleared out-spot. The skillet will still be plenty hot enough, so gently stir the seasoning with a wooden spoon until is starts bubbling. 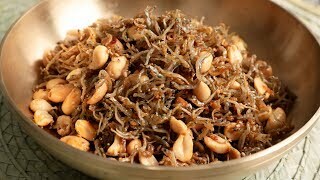 Mix the seasonings with the anchovies and peanuts until they are well coated. Stir in the sesame oil and sesame seeds. Serve right away with rice, or let it cool down and transfer the anchovies to an airtight container. You can keep them in the refrigerator for up to 1 month. Posted on Sunday, June 15th, 2008 at 9:37 pm. Last updated on October 21, 2018. Posted November 25th, 2018 at 5:18 pm | Log in to reply. I bought small anchovy but not the really small ones. Do I have to worry about the intestine removal in the smaller sized anchovy? Should I remove the heads or is it fine to leave them on? Posted December 2nd, 2018 at 9:26 am | Log in to reply. It depends on how small they are, but you can probably eat them whole. Posted November 16th, 2018 at 8:53 am | Log in to reply. Posted November 3rd, 2018 at 11:28 pm | Log in to reply. I made Myeolchi-ttangkong-bokkeum: 멸치땅콩볶음 Maangchi ‘s recipe. I need to confess I had not great expectations with this dish. But when I tasted it… OMG…. This dish is AWESOME! Posted November 16th, 2018 at 8:30 am | Log in to reply. Posted January 27th, 2018 at 11:21 pm | Log in to reply. Posted January 27th, 2018 at 11:22 pm | Log in to reply. Posted February 3rd, 2018 at 5:56 am | Log in to reply. It looks great Ermin Fei! I’m sure your husband’s Korean friends enjoyed your myeolchi-bokkeum! Posted December 12th, 2016 at 5:10 pm | Log in to reply. Posted December 14th, 2016 at 10:55 am | Log in to reply. Great! Thank you for the tips for my other readers! Posted August 11th, 2016 at 4:07 am | Log in to reply. I’m a lady engineer from Sri Lanka..
Posted May 22nd, 2016 at 4:28 pm | Log in to reply. Posted December 28th, 2014 at 7:19 pm | Log in to reply. Wow, Maangchi! Great recipe. I have to say, the quality of the Gochujang matters. I used one brand the first time I made this, and it was very grainy flavored, and I switched brands and much different, much more tasty! Wonderful recipes! Posted September 10th, 2014 at 10:11 pm | Log in to reply. Thank you so much for this great recipe. I’m so lucky to have found you here. 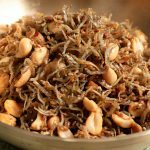 I used tiny dried shrimps and they taste even better because it’s less chewy and much cheaper too. The only bad thing about it is that I finish them even faster…..Thank you Manngchi! Posted September 11th, 2014 at 4:00 pm | Log in to reply. Posted March 27th, 2014 at 3:55 am | Log in to reply. Could you help me ! I finished this small fish, however the fish stick together ? Posted March 27th, 2014 at 12:45 pm | Log in to reply. Posted March 2nd, 2014 at 10:14 am | Log in to reply. All I can say about 멸치볶음 is that it is super easy and quick to make, mouthwateringly delicious and very addictive! I don’t know how it could last 2 weeks in my refrigerator because it is sooooo good! Posted March 3rd, 2014 at 1:23 pm | Log in to reply. You are more and more getting into Korean cooking as time passes! Now it sounds like you make all side dishes very easily and fast! Congratulations! This recipe was originally posted on June 15, 2008 at 9:37 pm by Maangchi. It was last updated on October 21, 2018. The video was watched 202,892 times on YouTube & has 7,543 likes! This video is a remade version of an earlier recipe. The original video was posted on 2008-06-16 and has 327,817 views.